never understood the random naked courier frantically running at me just to give me a "Letter from a friend"
where did he store this letter during transit? also, when pickpocketing the underdressed skyrim-postal-employee, CLOTHES are in his inventory. fashion statement? civil disobedience? faster run times?....Nay! it is a lifestyle choice. @Shibby - got this pic from the official forums was a fun contest of adding lines etc to the pic. I have never seen this guy before, but that is pretty hilarious. i do not get the joke of the caption itself though..redoran was a great house in morrowind right? Yeah Redorans are a group of humans in the Elder Scrolls. 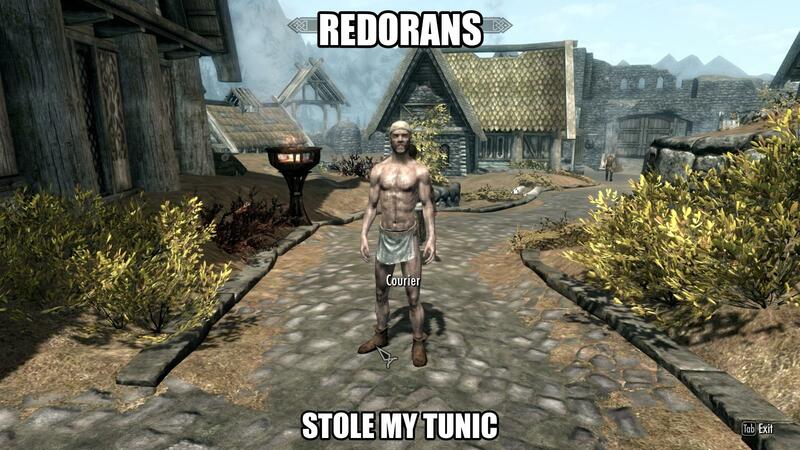 Although was once a great house formed by the Dunmer.